This past weekend, October 28-29, was held the annual pilgrimage from Washington, D.C. along with pilgrims from Brooklyn, Lakewood, N.J. and many other parts of our country, to commemorate the tragic murder of the guardian of the Iveron Myrrh-streaming icon of the Most Holy Theotokos. This year had special resonance, it being the 20th anniversary of this sorrowful event. 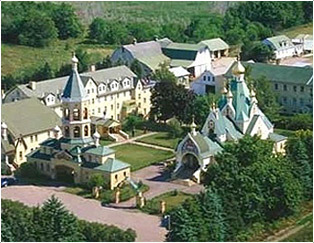 More people than ever assembled in the monastery to participate in the pannikhidas, the lectures, to see the interesting exhibit put together of Jose’s possesions, and to take part in the monastery services, the All-Night Vigil Saturday night and the Hierarchal Divine Liturgy, presided by our primeate, Metropolitan Hilarion. The church rarely has been seen to be so packed, and over 270 people partook of the Holy Mysteries, akin to Pascha. Sermons were given about the meaning of the murder of Brother Jose, the disappearance of the Myrrh-streaming Icon and the appearance, as it were, of its replacement, the Hawaiian Icon, the 10th anniversary of its appearance also being commemorated. For more details of the pilgrimage weekend, please refer to the Eastern American diocese website.